Amsterdam attraction-guides.com - Amsterdam, Netherlands attractions guide featuring Amsterdam, North Holland Heinekenbrouwerij / Heineken Brewery Museum information, location, contact details, features, opening hours, admission and general Amsterdam, North Holland, Netherlands, NL Heinekenbrouwerij / Heineken Brewery Museum information. - Last updated 30/10/2012. The Heineken Experience documents the history of Heineken in detail and offers a fascinating insight into how the beer is brewed. One of the main attractions is the museum's impressive tour, which covers the whole brewing process, from start to finish. 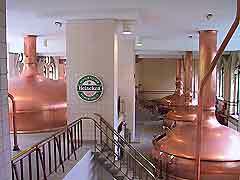 The original brewery dates back to the 16th century and was purchased by Gerard Adriaan Heineken in 1867, with Heineken beer being brewed here until 1988. Nowadays Heineken is exported throughout the world and is probably the world's best-known brand of Dutch beer. The informative tour ends in the Brewhouse Bar where a very convivial atmosphere soon develops, as each visitor is treated to several glasses of beer for 'tasting'. There is also a popular gift shop selling a range of Heineken-related souvenirs.